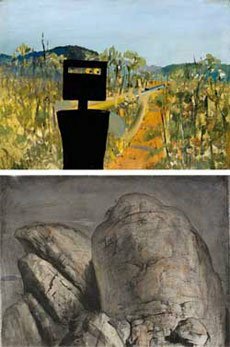 This Focus Room exhibition presents four recently acquired masterpieces by four artists who, in their own ways, have defined certain boundaries and aspirations of modern Australian painting: Sidney Nolan (1917–92) First-class marksman 1946; Arthur Boyd (1920–99) Bride carrying a ram 1962; Ian Fairweather (1899–1974) Last supper 1958; and Lloyd Rees (1895–1988) The Summit, Mt Wellington II 1973. Each of the four works summarises an essential vision that belongs to the epithet of iconic masterpiece. Through Nolan and Boyd we sense the force that emerged in Melbourne under the patronage of John and Sunday Reed at Heide in Templestowe, and the combustive forces of a creative family at Murrumbeena. Fairweather represents the itinerant genius that was an essential part of the mix of contemporary painting that evolved from the late 1950s into the 1960s, and Rees reflects the survival of a deeply romantic concept of landscape that has its source as far back as early 19th century Europe. Top: Sidney Nolan (1917–92) First-class marksman 1946, Purchased with funds provided by the Gleeson O’Keefe Foundation 2010. Bottom: Lloyd Rees (1895–1988) The summit, Mt Wellington II 1973, Edward Stinson Bequest Fund 2009.